On August 21, 2015, Szekely will shine a spotlight on four creations of his: 1) his debut recording with his JS3 trio; 2) his revolutionary invention, The Pickup Test; 3) his Improvisor’s Guide to the Cello; and 4) his co-creation of the acclaimed String Project LA. 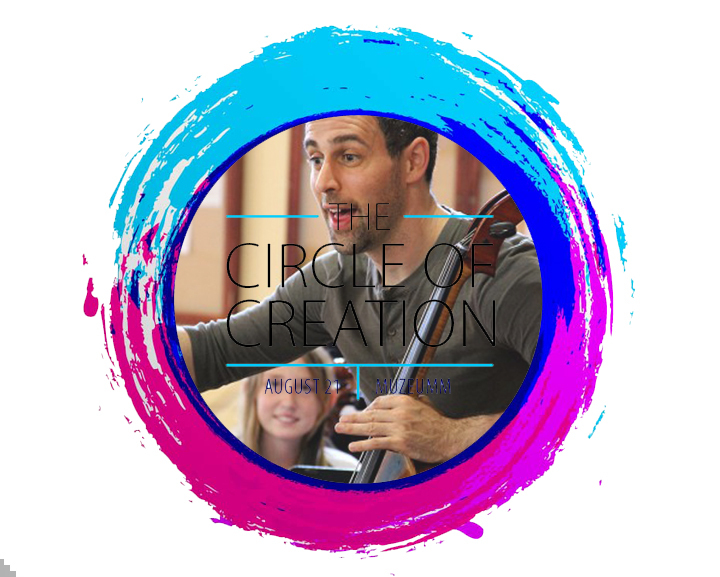 Szekely has created Circle of Creation, an event for musicians, press, fans and the public that will include demonstrations of the Pickup Test; listening stations; a short talk by Szekely; an opening concert by String Project LA students; and two full concerts by JS3. The event will take place at the buzzed-about Los Angeles art gallery Muzeumm, located in the burgeoning creative enclave of West Adams. Admission is $20 and includes a signed copy of the debut JS3 CD. Small bites will be provided, and the cash bar will be open. 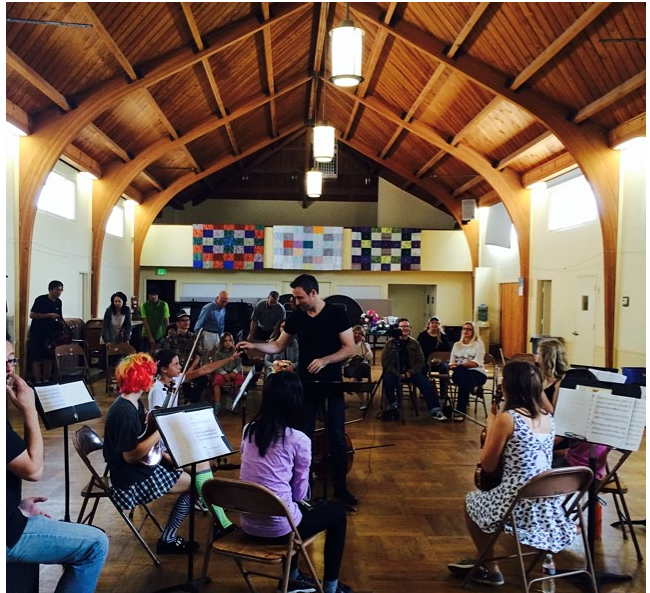 The program is: 5pm doors open / 6pm String Project LA concert / 7pm Ted-style Talk / 8pm JS3. The Pickup Test. Szkeley’s creation of the Pickup Test is a leap forward for all creative string players as it’s the first scientific and comprehensive sound library of every single pick up available on the market. A unique online media player created by Szekely in consultation with Grammy Award-nominated musicians and his instrument partners like Yamaha, the Pickup Test gives amplified violinists, violists and cellists the opportunity to hear what the pickups sound like and to compare equipment. The website also features tabletop reviews and interviews with today’s leading creative string players. Biography. Born in Brooklyn to Eastern European parents of Jewish heritage, Szekely left early to move to Kentucky, where he began listening to bluegrass, rock and eventually jazz. 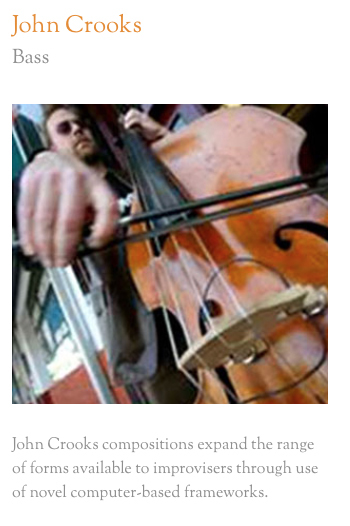 He studied classical cello performance at the Interlochen Arts Academy and earned his masters degree at the University of Southern California. He became intent on developing a new language for the cello and, in 2004, formed the jazz string quartet Supernova, which was hailed by Turtle Island String Quartet among others. He subsequently formed Eartha Austria Trio, an electric fusion group, and teamed up with percussion master Chris Garcia in the lauded world/jazz/chamber group Quarteto Nuevo. Szekely’s unique perspective as a groundbreaking solo artist, school founder, and author have made him one of the most in demand clinicians in the crate string world. 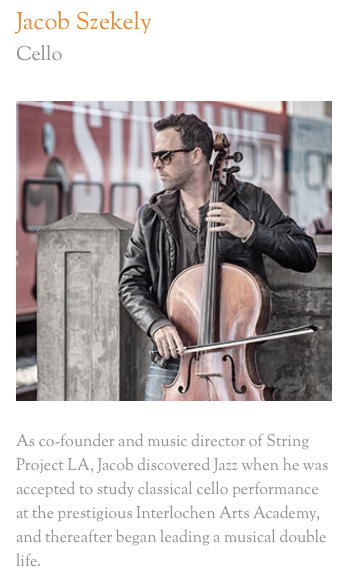 Founder of the Los Angeles Creative String Festival, he’s served as faculty for summer festivals including Christian Howe’s Creative Strings Workshop in Columbus, Ohio, and the New Directions Cello Festival in Ithaca, New York. An active composer and arranger, Szekely has performed with a wide range of artists and ensembles from string quartets and world music groups and has been commissioned by a chamber orchestra and a children’s choir.